All of the participating parks will deck their halls with twinkling lights and other holiday finery and present holiday-themed shows. Old St. Nick will be on hand making spirits bright. Because this is Six Flags, many of the coasters and other rides will be open for the event—even when temperatures may dip into the frosty zone. Info about which parks will be celebrating Christmas and the holidays and some of the event details follows. The parks offer discount event tickets if purchased online in advance. (Direct links to each of the park's official holiday Holiday in the Park pages are included below.) Note that admission to the events are available for both 2018 and 2019 season pass holders. Holiday in the Park will feature an enormous Christmas tree, a snow hill for sledding, and loads of festive decorations such as a giant snow globe. There will be a nighttime, holiday-themed dolphin show. Other shows starring Looney Tunes characters will be offered as well. Features will also include Toy Land, Candy Cane Lane, and Christmas Tree Forest displays along with new themed areas, Winter Wonderlane and Merry Marketplace. Nighttime rides aboard favorites such as the SkyScreamer swing and the Superman Ultimate Flight coaster will be all the more enchanting amid the holiday lights. For its fourth Christmas event, Six Flags Magic Mountain will greet guests in the fountain area near the front of the park with a huge Christmas tree. The park is promising tens of thousands of lights that will be synchronized to holiday tunes in the DC Universe land. The Mining Town area will be converted into a retro Winter Wonderland with crafts making and seasonal treats such as hot chocolate, cider, and specially flavored funnel cake (drizzled with candy canes perhaps?). The Hanukah treat, potato latkes, will also be on the menu. Six Flags Over Georgia will temporarily rename its circa-1908 Riverview Carousel as the Candlelight Carousel and give it a huge dose of Christmas cheer with the lights and ornaments. Likewise, the park's train ride will transform into The North Pole Express and whisk passengers away to meet Santa and Mrs. Claus. The popular Monster Mansion will also get a holiday overlay as Mistletoe Mansion with a Christmas story and festive decorations. With over 100,000 lights, snow machines, an adorned tree, and other enhancements, the promenade at the front of the park will become A Main Street Christmas. Other themed areas will include Peppermint Plaza. The park will give visitors the opportunity to roast marshmallows and make their own treats in S'mores Village. 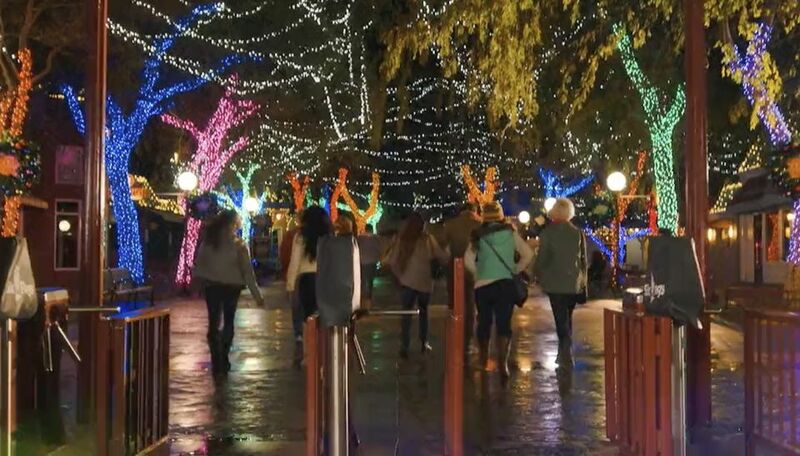 This will be the first year that the Midwest park joins in the holiday-themed fun. As at the other Six Flags locations, Great America will deck out its midways with lights, offer seasonal food such as hot chocolate and s'mores, and crank up its coasters and other rides. 2018 will mark the second Christmas event for Six Flags America. Coasters such as Superman Ride of Steel and the park's other rides will be open for the event. Expect plenty of hot chocolate, s'mores, more than one million lights, and other seasonal treats. This will be the second year that the Massachusetts park will celebrate the holidays Six Flags style. It is promising goodies such as caramel apple funnel cakes and eggnog, rides aboard the New England Express train, thrills such as The Joker 4D Free Fly Coaster, and special shows. This will be the third Christmas season that Six Flags St. Louis will offer Holiday in the Park. The park is promising over one million sparkling lights, street entertainment, and holiday-themed shows. To help keep visitors warm, Six Flags will offer hot chocolate and crackling fires. Expect mighty cold weather at Six Flags Great Adventure's Holiday in the Park, but try to stay warm enough to give the park's incredible arsenal of rides a whirl. There will surely be a considerable wind chill factor aboard world-class coasters such as Nitro. There will be scads of twinkling lights, some man-made snow showers to go along with any actual snow, hot chocolate and cider to wash down fried s'mores (fried? ), carolers, a stage show, and other special features themed to the holidays. The Great Escape theme park is not presenting Holiday on the Park, but the adjacent Six Flags Great Escape Lodge indoor water park resort is offering Holiday in the Lodge. Santa and Mrs. Claus will greet children. There will also be holiday shows, carolers, special food, crafts, and other seasonal activities. The resort will also celebrate New Year's Splashin' Eve on December 31. This is the first year that Frontier City is back in the Six Flags fold, and this will be the first year that the park will present Holiday in the Park. Expect visits with Santa, twinkling lights, seasonal treats, and select rides to be open for the event. In addition to its lineup of roller coasters (including the wonderful Iron Rattler) and thrill rides, Six Flags Fiesta Texas will be offering live entertainment and lots of holiday decorations for the seasonal event. The Christmas event features choreographed lights, festive food, and special shows such as "The Majesty of Christmas." Bugs and his pals will be decked out in their holiday finery. You could ride the Holiday Express train and enjoy the Singing Saps, animated Christmas trees that warble holiday tunes. Carolers will roam the streets, and a certain jolly gent and his Mrs. will be on hand in Santa's Castle. Expect plenty of entertainment and holiday decorations for the seasonal event. Six Flags will amp up the holiday hoopla with thousands of lights, festive food, and a slew of themed shows such as "Honky Tonk Christmas" and “Fa-La-La-La.” SantaLand will offer hang time with ​the holly-jolly fellow and his elves, and Mrs. Claus will present a Christmas craft workshop. Take the SantaLand Express train to visit the magical place. There will also be snow sledding down Frosty Hill.